Is there a space for Urban Planners who are designers? I spent the better part of my first year as a grad student in urban planning clarifying for family and friends whether I was studying urban planning or urban design. To their credit, I am studying planning at a design school. Also to their credit, I ramble about design a lot. So what’s the difference and does it matter? Well, it must matter otherwise Harvard wouldn’t offer degrees in both urban planning and urban design. To enter the Urban Design program, you need to already hold a degree in architecture (which I don’t and definitely never will). This sets a high bar for the skills and backgrounds required to become an Urban Designer. Firms hiring Urban Designers will expect these skills and backgrounds. So where does that leave us urban designers? I’m an Urban Planner with a strong focus and official academic concentration in urban design, but this doesn’t make me an Urban Designer. Yet, design is how I see the urban space, how I frame urban issues and how I solve urban problems. For me, planning can’t be separated from design. I know governments and design firms employ Urban Planners, and I know they employ Urban Designers. But is there a place for Urban Planners who are designers? Last fall, I took the brilliant course, Urban Design for Planners, taught by GSD Lecturer (and Tombow aficionado) David Gamble. The class introduces planning students to the profession of Urban Design while also teaching the techniques and skills of urban design. Every week, we literally put pen to paper. 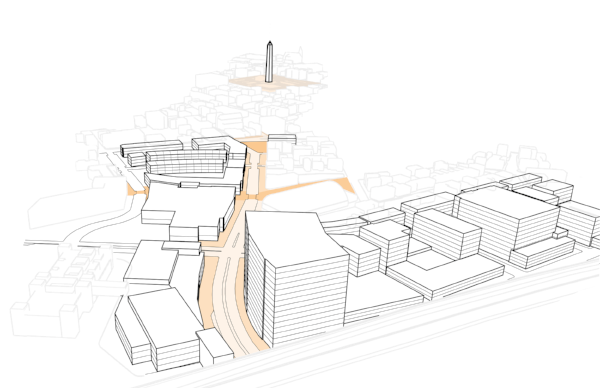 We stretched our Rhino and SketchUp capabilities to mass and model site designs. We manipulated Photoshop to produce concept collages. We studied successful urban design cases studies and practiced perspective drawing until our eyes crossed. One semester of urban design training by no means amounts to the two years Urban Design students commit to the GSD (nor the many more years prior spent earning architecture degrees). But it’s also not nothing. The planners who walked out of that course have bona fide and useful urban design skills. What are we going to do with those skills? For some of us, we’ll find work as one of the small minority of planners employed in design firms large enough or complex enough to warrant hiring a strict urban planner with strong design skills. For most of us, we’re going to have to prove ourselves and our skills to push boundaries and expand the range of places we’re allowed to enter as planners. I strongly believe there’s a place in the urban planning profession for strong design skills. I think our cities benefit when Architects and Urban Designers shape the built environment alongside Urban Planners who understand and can execute design. I’ll never have the skills and expertise of an Urban Designer, and that’s okay. Planners need their skills. But while I’ll never be an Urban Designer, I’m not giving up on being an urban designer.